Ghost Hunting Theories: Cannibals - Where Did They Learn It? Cannibals - Where Did They Learn It? The son of Nelson Rockefeller, Michael Rockefeller, went in search of primitive art. He had gone as a young man to New Guinea and learned a love of photography and art. In 1961, he went back with a companion when their boat overturned. The clung to the keel and Michael swam to shore. That was the last he was seen. Described as a quiet artistic type, Michael grew up with his siblings in the midst of his father's vast collection of art from exotic places around the world. He was an ambitious young man in college and his father put him on the board of directors for the museum. When he went on the expedition to New Guinea, it was a place that still had not seen much of western visitors. When he swam to shore, it was the last reported of him. 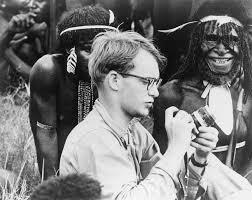 What happened to Michael Rockefeller? We will probably never know if he drowned, was eaten by sharks, taken in by locals or eaten by them, but this South Pacific island is the heart of ancient giants territory and also the practice of cannibalism often associated with ancient giants who appear to have been the original cannibals. Repeated in folklore of native cultures around the world, there were giants who were cannibals. One of the more infamous stories is that of the of the Paiutes who say their ancestors fought red-haired giants in the Nevada area. They were described as cannibalistic, even digging up the newly dead and eating them. They reported having trapped the giants in a cave and burning them to death. Many thousands of years later in the early 1900s, the skeletons were unearthed in the cave by guano farmers. Kuru is a neurological and incurable disease obtained by eating flesh from humans and animals with the prions (an infectious process in a protein that causes a strange folding). This disease causes tremors and uncontrollable laughing or "Laughing Cow Disease" as some commonly refer to it. The person no longer takes nourishment, cannot walk, shakes uncontrollably and dies. The origins of the disease were believed to be from one person who had Creutzfeldt-Jakob Disease and, as was practiced by members of the tribe, they ate the deceased family member to keep their life force alive. Were there giants in the territory best known for cannibalism in recent history - New Guinea? Yes! Locations in Indonesia include this mythology from Java: The myth of Aji Saka tells the story about the coming of civilization to Java, brought by the legendary first king of Java Aji Saka, and the story of Javanese script. Soon after the gods created and nailed the island of Java, the island become habitable. However the first race to rule the island were the denawa (giant demon) that repressed all creatures and ate humans. The first kingdom in Java was Medang Kamulan, and the king was the Giant King Dewata Cengkar, the cruel King of the country who ate the flesh of his own people. Where did the tradition of cannibalism come from? Let's look at a popular adaptation - humans desire to emulate those they believe are superior. The practice of binding children's heads in cranial deformation by some cultures - cultures visited by giants, by the way, shows a desire to emulate someone perhaps considered holy, god-like, powerful or impressive. Is it possible that they were emulating the slope-headed architecture and pointed back of the head found on ancient giants? If ancient giants were also cannibals by their very carnivorous construction and jaw, then perhaps something that to them was a base instinct to eat others was actually emulated by the locals as a way of taking on the spirits of those they conquer. This ancient practice of cannibalism came from places such as the Lesser Antilles, Melanesia, Fiji, Congo, Amazon and New Zealand. All of these are areas noted for giants. In fact, Neanderthals were said to have been cannibals. For these societies in more modern era, it was a cultural and spiritual practice, but there is evidence in ancient skulls that some human relatives with sloping foreheads, prominent brows and powerful jaws were made to be carnivorous and predatory. Their very practice and tendencies could have influenced others where their boats landed and they came ashore. If the origins of the giants were somewhere in the South Pacific, it would explain a very southern hemispheric influence on practices of cannibalism from Africa to New Guinea, Australia and the Amazon. If they bred with the locals, they might have even bred in tendencies. This isn't to say that cannibalism isn't something basic within all homo sapiens, but that there was a very ancient society of giant people with a well reported history of eating others and in these giant-rich lands the Native People have the tendencies to perform cannibalism, there seems to be two people in the same place practicing the same thing; one perhaps because of their very physiology and nature and the other because of spiritual and cultural practices.